Sometimes when a movie does everything right, you don’t even think about how wrong it could have gone until after it’s over. Creed, out Nov. 25, could have gone wrong in so many ways. Directed by Ryan Coogler—whose deft 2013 debut, Fruitvale Station, chronicled the last day of Oscar Grant III before he was fatally shot by a BART police officer in Oakland—Creed introduces us to the illegitimate son of heavyweight champ Apollo Creed, who first bounded into the ring in the 1976 underdog hit Rocky. In a movie landscape littered with resuscitated franchises, this runs the risk of being just more of the same. Like Rocky, a smash that spawned 1,000 sequels (or so it seems), Creed mingles go-for-broke romance with bloody pugilist thrills—but instead of feeling like a rehash, it works like gangbusters. Coogler honors and builds upon theRocky formula so that it feels both comfortingly old-fashioned and bracingly new. Audiences instantly adored Rocky, for good reason—it’s a great date movie, and Creed is too. You won’t have to be a lover-not-a-fighter to love it. Adonis Johnson (Michael B. Jordan, who played Grant in Fruitvale Station) spent much of his childhood bouncing in and out of group homes. His mother, who gave birth to him after an illicit liaison with the champ Apollo, died when he was very young. He’s an angry kid with no outlet for his feelings, until a woman he’s never met, Mary Anne (Phylicia Rashad), comes to collect him and raise him as if he were her own. Mary Anne, it turns out, is Apollo Creed’s widow, and it’s easy to guess how much suffering her husband’s infidelity must have caused. Yet never inCreed is she given a line of dialogue explaining why she rescued Adonis—her need to do so is part of her being, and Coogler (who co-wrote the script with Aaron Covington) trusts the audience to understand that. Naturally, boxing is in Adonis’ blood: even though he’s now a responsible adult with a good job—and an eagerness not to disappoint his adoptive mother—he can’t help sneaking off to Tijuana to hone his chops in the ring. His yearning to claim his paternal legacy, and to build his own name, eventually takes him to Philadelphia, where he tracks down his father’s old opponent, Rocky Balboa (Sylvester Stallone), eventually persuading the long-retired slugger to train him. He also meets a woman, Tessa Thompson’s Bianca, a gifted singer who happens to be losing her hearing. That’s the stuff of melodrama, and it’s also part of what makes Creed so pleasurable: Coogler understands that intensified circumstances aren’t things to be laughed at—they’re like cushions where we can rest our own unresolved feelings for a while, and they’re the stuff of great art and popular art alike. 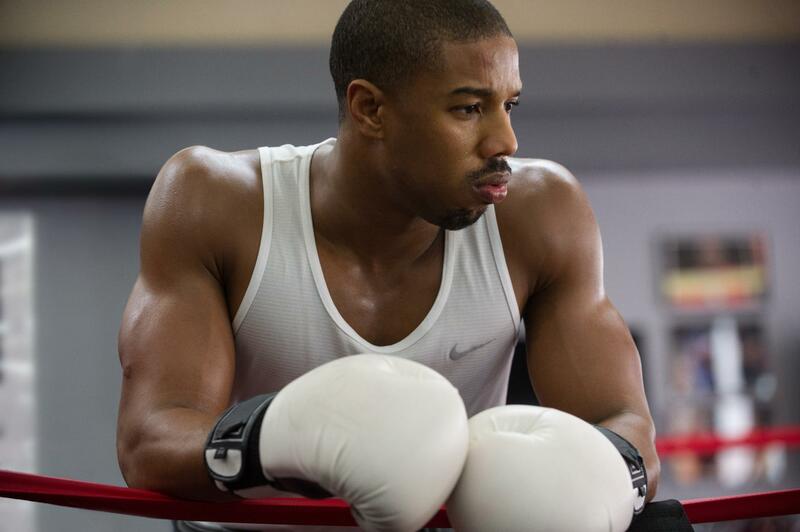 Coogler keeps everything moving so gracefully that by the end of Creed, we almost don’t know what hit us. In an early, stunning sequence, Adonis calls up one of his father’s old fights on YouTube—it’s Creed vs. Rocky Balboa—and projects it on a wall, big as life. He can’t keep himself from leaping right into the action, figuratively joining the dance: He jabs at his father’s ghostly onscreen image, trying to work out a lifetime’s worth of frustration with every punch. Later, a flesh-and-blood match between Adonis and an egotistical Philadelphia scrapper is shot, in one take, with floating precision: The camera swirls around the fighters as if it were capturing the movement of two leaves in the wind. The picture’s climactic fight, in which Adonis squares off against an undefeated Liverpool thug (real-life UK boxer Tony Bellew), is far more brutal and visceral, though no less gorgeous: When Adonis takes a rock-hard punch to the jaw, we see him go down in excruciating slow motion—the flesh of his cheeks is silk billowing in the wind, reminding us that all faces, even those of boxers who have learned to take a punch, are things of exceptional fragility. Jordan’s face, in particular, is the kind you feel protective of. He’s charismatic in a totally carefree way—you never catch him trying too hard, and his scenes with Thompson have a lovely, bantering lyricism. But his truest comrade is Stallone, who’s wonderful here. Rocky Balboa is the most vivid character of Stallone’s lifetime, and he slips right into it like a pair of sweats that have permanently taken the shape of their owner. Stallone’s face doesn’t have the loose softness that it should, considering he’s 69. He’s worked too hard at preserving the firmness of youth, when what made his mug so beautiful in the first place was its shy, revealing malleability. Even so, it’s a kisser with some character: It looks stylized, like a 1976 artist’s rendering of what Rocky Balboa might look like in 2015. Sometimes you need an old dude to create a context for beautiful young people. Stallone does that, and more, in Creed. Looks like another love TKO.